Aug. 30, 2017, 10:12 a.m.
By Laura Hazard Owen @laurahazardowen Aug. 30, 2017, 10:12 a.m. It can be tempting to write Medium off for dead. The company laid off a third of its staff earlier this year. The bigger-name publishers who migrated to Medium have left. (Goodbye to: The Ringer, Backchannel, The Awl, Pacific Standard, Film School Rejects, ThinkProgress.) They mostly returned to WordPress — or in The Ringer’s case, to Vox, or in Backchannel’s case, to Condé Nast. “The move to Medium was a cool experiment, in my opinion, but the year is up and personally I missed the ads,” wrote Sylvia Killingsworth, editor of The Awl and The Hairpin. All of these publishers left, largely, because they still like ads (at least some ads), and the future that Medium founder and CEO Ev Williams sees for the company — and dreams for with media in general — doesn’t include advertising, not even the native advertising that was a key piece of Medium’s plan when it rolled out its publisher program back in 2016. There’s reason to be skeptical of this. Many of the companies that left Medium didn’t want their business models to be driven by advertising; they just wanted to have ads as an option, and they weren’t close to being able to sustain a business on subscriber revenue, even if they’d do that in an ideal world. “We’d love to be able to do this all without ads, but there’s no money in that,” Film School Rejects’ Neil Miller wrote in May. And Medium’s new money-pooling model, which doesn’t allow paying just one creator directly, is also not appealing to some publishers. “I’ll eventually need to move to WordPress so I can add subscriptions in a meaningful way,” said Derrick Harris, the founder of ARCHITECHT, which is currently hosted on Medium. (Harris is also my former colleague at Gigaom.) The model Medium is going for instead is “maybe okay for hobbyists or freelancers in between paying gigs,” Harris said, but he doesn’t believe it can work for someone hustling to run their own publication full-time. Of course, Williams disagrees. “For those who do well in the program, there’s every reason to expect that they can make more money writing here than they could at an ad-based publication,” he said. I talked to Williams about the company’s most recent changes; here’s our conversation, slightly edited for length and clarity. Laura Hazard Owen: The different iterations of Medium have been a little confusing. You shut down your publisher program in January, and then added a $5/month membership program in March, and now there are more changes. What’s the state of things now? Ev Williams: Since we originally launched our paywall and subscription and announced the partner program in March, the big change is we’ve developed this thing that allows people to publish without us explicitly commissioning them and approving what they publish before they get paid. Previously, if people wanted to get paid, we were working with them individually, accepting pitches, going back and forth doing light editing, signing contracts in a more traditional way and paying them on those terms. The big change, essentially, is that once they’re in the program, people can publish themselves and get paid on performance. It’s a dramatic change, but it was always our plan to figure out how to do this. The nature of Medium is an open platform. We wanted to introduce this new economic model powered by user subscriptions, but building a system we thought would pay out fairly, and building the right type of content, was non-trivial. We first started learning by doing it more manually — building, basically, the pipe to take money and charge money and build the subscriptions database. The long-term plan has always been to figure out how to scale that to many more creators and remain open. Owen: How many people have signed up to be partners since March, and how many are working with Medium now? What are some of the things they have in common? Williams: A couple thousand people applied right off the bat, and we’ve worked a couple hundred of them over the last couple of months. A lot of those were people who had been writing on Medium. The vast majority of people who write on Medium don’t do so for money. Some aspire to do so; some write professionally in other cases and not on Medium. We have a ton of writers on Medium, and the majority of them aren’t really our target for our partner program. We don’t want to suggest that everybody who writes should get paid or try to get paid. Owen: So are those more direct relationships, with the editing and such, now coming to an end? Williams: Not necessarily. We’re continuing to work with some people right now as we ramp up this other system. It’s likely that we will be working with some writers longer-term, as well as publishers. There are still publishers and studios that we signed contracts with. Owen: A lot of the publishers left, though. The Ringer, The Awl. Williams: Some of the bigger ones have left. There are hundreds of publishers still on Medium. We talked to The Ringer and some of the others at the beginning of the year about what their plans are and what our plans are, and we made clear that anyone who is dedicated to pursuing an ad-driven business model is probably not the best fit. We’re not going to be developing or incorporating ad technology. It made sense for publishers who needed that to migrate off. There are lots of publishers who weren’t doing [advertising] and for the most part they’ve stayed, so that’s really the distinction. There wasn’t a lot of doubt that we shouldn’t partner with people who had incompatible business models with us. Owen: So native advertising — which you guys previously seemed to see as a promising area — is gone, too? Williams: We’re not doing any advertising, native or not. All the advertising on Medium, pretty much, unless publishers did it themselves, has been native. We did a few native content projects with brands, both ourselves and in partnership with some of our publishers. Those deals actually worked pretty well, and we saw a path there, but it wasn’t the long-term path that we wanted to pursue. There are, of course, publishers still on the platform who may write sponsored content for brands. There are a few features in our publishing tools that still accommodate that. But it’s not something we’re encouraging or pursuing ourselves. We believe in the user-supported model and we’re putting as much attention and focus as possible on making that work. Owen: You mentioned that there’s a qualification process for writers who want to come on and get paid. What do they need to do? Williams: It’s not a rigorous review process. We’re not saying you have to have a certain qualification. Our attitude is that great ideas can come from anywhere. We definitely want established professionals on the platform, but we also want to give an opportunity to up-and-comers and less established folks. We’re not putting out a bunch of criteria. We had to do two things in terms of rolling this out. Eventually, we want it to be as open as possible: There’ll be a set of rules, and if you adhere to the rules, great. But before we open it up totally, we want to test our system. There are probably things we’ll need to tweak. We also need to balance the market, to some extent. If we were to open it up completely right now, I think we would have too much good content and we only have so many subscribers. If we opened the floodgates of content, we would just have too much content. Again, as a marketplace of sorts, we need to balance the supply and demand side. Williams: That Kindle program is probably the most similar to ours. It’s also not that dissimilar from Spotify or some other subscription services, where there’s a pool of money that is ultimately tied to the subscription revenue and how that’s divided up is based on the subscriber behavior. Kindle pays specifically on pages read, I believe. Spotify pays on plays. We essentially pay on votes, which we’re calling claps. But in essence, they all work the same way, and it’s ultimately up to the readers and paying subscribers who gets paid, and how much. Some of the reports on this were really off-base on about what we’re doing, by the way. The behavior that counts for payout is only from subscribers or paying members, so a lot of the assumptions about this being easy to game are not valid. Also, one of the differences between this and some other systems is that the payout is per user. For each cycle, we will deliver a budget per paying member. How each member’s portion of that budget is distributed is according to their behavior. It’s not that the post with the absolute most claps gets the most money. It’s that: If you engage with one author, in the extreme case, all of the money from you goes to that author. If you engage with a thousand of them, that money goes to a thousand of them. It gives more agency to the member and it allows people who may have a small fan base or be in a niche area to still do well, because the majority of their fans’ money will go to them. Owen: So if, for example, I am a paying member and I only like reading stuff about cooking and I never read anything about sports — none of my money goes to sports content? Williams: Pretty much none of your money goes to something that you don’t read. In fact — we’ll have to see how this plays out — but if you read something and you don’t like it, or if you just view something because you’re curious, the author will not get paid. It’s unlike an ad system where just viewing something pays as much as actually reading it. Owen: How will you know if I am really reading something or just viewing it? The claps? Williams: Because [all the paying subscribers] are logged in, we know what they’ve read. Some people think the clap mechanism is goofy, but it’s a fairly natural way, once you get used to it, to explicitly signal that this is worth more to you than something else. It’s a choice the user makes after they’ve seen the content, not before, so it’s harder to manipulate than a click or a view or even time spent. It’s also variable, because some things are worth a lot more than other things. Those two factors combine really allow the user to determine where their money goes, but the reason we don’t give people, like, a dashboard to determine where their money goes is that what we’re trying to do is balance the ability to give that explicit variable input while also not causing people to have to think too much about it. We don’t want to make it too hard. Williams: In all of our documentation, we’ve said payout is based on engagement. We put the emphasis on claps because that’s a very concrete thing, but we’ll look at all these factors. You can think of Google’s quality ranking, which is something that evolves over time. There may be exceptions to their core metrics, and metrics may be gamed, but [overall it works]. I don’t know if we’ll share our exact algorithm, because that makes it easier to game, but we will share what signals we’re looking at, if and when we incorporate more. We’re just going to have to see how people be have. How they’ve behaved [on Medium] historically does give us a lot of data that we’re basing this on, but we know that with money involved people may behave differently, so we have to do a lot of learning. Owen: I’m just thinking back to the spring of 2016 when Medium rolled out its publisher program, and things are so different now. I’m wondering what changed your mind about this mission, what changed your mind about the way digital media works overall. Williams: It’s fundamentally about advertising. That’s what I changed my mind on. Just to be clear, the mission of Medium has always been the same: What we’ve been trying to figure out is how to create an ecosystem that supports the creation and distribution of great ideas and important content. There was a phase in the first couple years when we were really focused on the tool: How do we create a great tool for those who want to write and share things that are not professional and don’t want want to get paid for it? That’s still a big part of Medium and always will be. As we started to move into the professional realm, obviously, supporting the content and the creators economically became critical. The most natural thing to do was to say, well, advertising is the model — we have an opportunity to do something that we think is better than the traditional display that’s all over the web by doing things native, and we have a lot of brands already coming to us and wanting to use Medium for content marketing. That was the default thinking for me because it was exactly what we did at Twitter. We did a platform, companies started using it very early on for commercial purposes, and if they were already using it, we could make it better for them. I sort of, probably prematurely, assumed the same thing would work here. In [April 2016], when we were courting publishers and brands to pursue that vision — it wasn’t that we decided that couldn’t work, but we decided it was not as likely to drive the mission that we wanted. If the content was ultimately getting paid for on the professional side by brands, it was eventually going to look more and more like advertising. We were already seeing that brands wanted tracking. There were a lot of discussions about whether content was above the fold that made less sense in the native world, but it was just how advertising is sold. We extrapolated out. The money can come either from brands, publishers, or users. What we want to do is create the best possible place to support great content. How does the best media in the world work? In almost every case, the best media is supported by those who consume it, whether that’s books or movies or, now, television and music. And traditionally, for magazines and newspapers, an important part of the revenue came from those who consumed it. The more I thought about that model, the more I realized it was the only way to really create an ecosystem that rewards and supports the best content there is. Once I realized that, it’s when we made the hard decision to switch. Owen: But — and this is sort of the perennial question, I guess — what about the quality, investigative work that really is important, but that people just may not be as interested in supporting? How do you fund that just with readers? Is there a place for that on Medium? Williams: Long-term, just looking the industry as a whole, I think that investigative journalism is super important and I’m optimistic about its funding from three sources. One, I think that for the big newspapers like The New York Times and The Washington Post, a huge part of their brand is built around those pieces — so from a purely business perspective, not even a mission perspective, it’s what helps them get the subscribers they do, and I think they’ll be able to keep doing it. Nonprofit money helps fund a lot of this type of work, but I also am optimistic that Medium can help fund this type of work, partly because of this idea of explicit action being more important than how many pageviews something did. We’re offering a way for someone to put something out there and for people to say it’s worthwhile and they want their money to go to it because it’s important. Owen: Is it possible that Medium would have some kind of Kickstarter-ish role with this program, where, say, a writer could post an idea for something they want to work on, and based on the number of claps it gets, they get funding? Williams: I think that’s a cool idea. It’s not something we are actively working on, but it’s something I would welcome people to do. In the meantime, if they apply to our partner program and write that that’s what they want to do, we are open to discussing it. 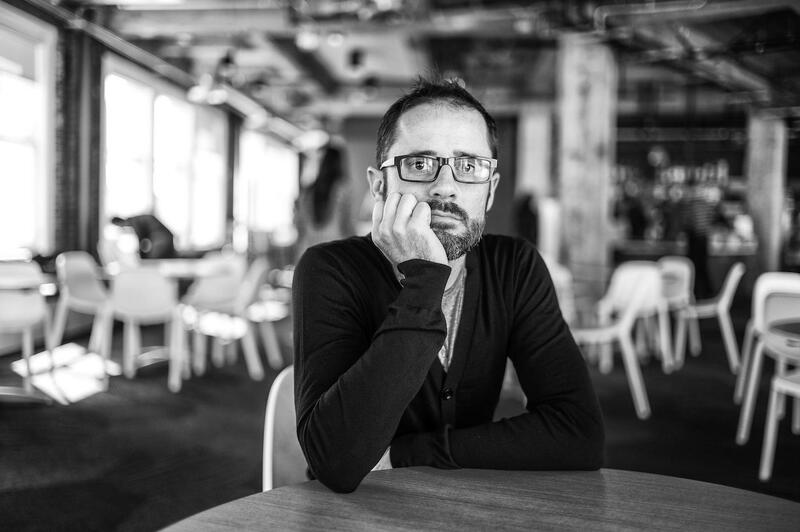 Photo of Ev Williams by Christopher Michel used under a Creative Commons license. POSTED Aug. 30, 2017, 10:12 a.m.
Owen, Laura Hazard. "Ev Williams on Medium’s Spotify-ish future, why publishers left, and why he changed his mind about ads." Nieman Journalism Lab. Nieman Foundation for Journalism at Harvard, 30 Aug. 2017. Web. 23 Apr. 2019. Owen, Laura Hazard. "Ev Williams on Medium’s Spotify-ish future, why publishers left, and why he changed his mind about ads." Nieman Journalism Lab. Last modified August 30, 2017. Accessed April 23, 2019. https://www.niemanlab.org/2017/08/ev-williams-on-mediums-spotify-ish-future-why-publishers-left-and-why-he-changed-his-mind-about-ads/.